In a large skillet, cook bacon over medium heat until crisp. Remove bacon paper towels to drain. Crumble bacon, and set aside. 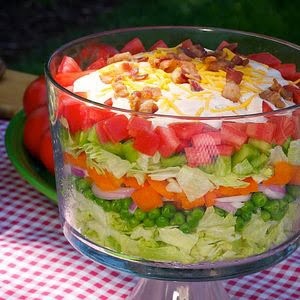 In a large trifle dish, layer lettuce, tomatoes, and cucumber. In a medium boel, combien baby peas and green onion, and layer on top of cucumber. Layer radishes over pea mixture. In a large bowl, combine sour cream, mayonnaise, lemon juice, and salt, stirring until smooth. Spread evenly over radish layer, sealing edges. Top with cheddar cheese and bacon. Cover tightly with plastic wrap, and refrigerate for at least 8 hours or up to 24 hours. Let stand at room temperature for 15 minutes before serving.